The Sawtooth Range (part of the Rocky Mountains) are comprised of the pink granite of the 50 million year old Sawtooth batholith. Drive, day hike, and backpack to impressive peaks and pretty wilderness lakes in Idaho, USA. Park your car/RV at one of the campgrounds, and at sunrise, see peaks of Sawtooth Wilderness reflect in Little Redfish Lake or Pettit Lake. 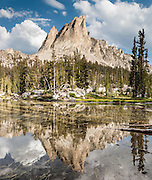 Sawtooth Wilderness, managed by the US Forest Service within Sawtooth National Recreation Area, has some of the best air quality in the lower 48 states (says the US EPA). Backpack or day hike to scenic El Capitan, Alice Lake, and Twin Lakes. Backpack or day hike 11.8 miles round trip to Baron Lakes viewpoint, starting with Redfish Lake Lodge's earliest boat to Redfish Lake Inlet Transfer Camp.